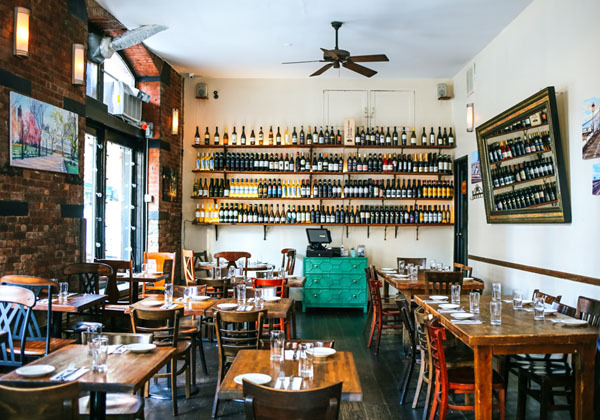 Fall is an excellent time to explore New York City’s dynamic culinary scene. Taste the rich bounties of the season around some of our favorite locales. Restaurateur Kiyoung Lee has partnered with Jeremy Seyoung in his newest venture: Turntable Rock Café & Lounge; a Korean Gastropub located in the edge of NOMAD and Koreatown. Inspired by Lee’s lifelong passion and love for music, specifically rock and roll, this casual eatery features a sleek industrial design including a “high-fidelity” sound system and Lee’s extensive collection consisting of 50,000 LPs. 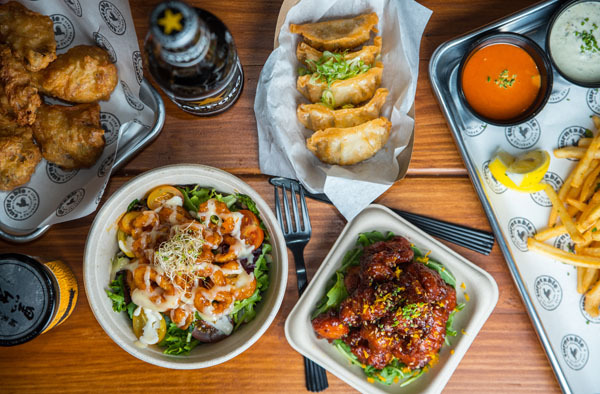 Turntable Café is an experience that is not complete without trying one of Executive Chef David Kwon’s delicious shareable small plates inspired by the street foods of Korea. The traditional Korean style fried chicken, which can be made either plain or slightly sweet soy garlic, is popular among diners’ and adds to the casual and fun environment of the restaurant. Kwon’s menu consists of comfort dishes infused with a Korean flair, such as the Kimchi fries, which are shoestring fries smothered in sautéed Kimchi, applewood smoked bacon, jalapeno, cilantro and sour cream. Other crowd pleasing favorites include crispy fried oysters with a katsu sauce and wasabi aioli, pork dumplings, and bulgogi tacos. Turntable is a place where friends can be brought together by good music and good food in a fun and casual environment. 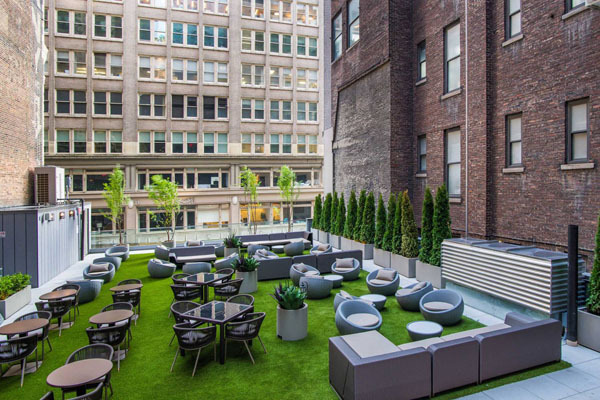 Dine alfresco under the stars above the lively and ever-changing city landscape while enjoying an evening at Embassy Suites’ terrace, SkyLawn tucked away in the Fashion District. This rooftop lounge has a menu of fun hand-crafted cocktails that developed in collaboration with renowned local mixologist and distiller Allen Katz. Guests can also dine on seasonal snacks and small plates as they unwind and enjoy the great outdoors in a casual and fun picnic setting that spans 3,500 square feet of outdoor space. Enjoy sharable elevated American comfort fare such as Wagyu sliders, mojito glazed sliders, buffalo chicken meatballs, and a mixed charcuterie board. SkyLawn has an atmosphere that is great for both out-of-towners and locals alike. The spacious lounge has comfortable outdoor furniture that is perfect for a mid-afternoon cocktail with friends. SkyLawn also has an outdoor cinema where movie-lovers can enjoy cult classics to academy award winning films on the big screen and sip on a refreshing cocktail from the bar before the show. Creative craft cocktails include a potent Mayan Margarita made with mescal and tequila or an Up on 37 concoction with vodka, crème de mur and raspberries. Taste the flavors of Italy and transport yourself to the coastal region of Naples without ever leaving New York City at Acqua. Executive chef, as well as managing partner, Giuseppe Marrone has recreated the flavors of the Southern Italian coast in the historic district of South Street Seaport, serving fresh fish flown in daily from the Mediterranean Sea and wine from every region of Italy. Acqua’s menu has an ample Raw Bar and a variety of daily specials such as the handcrafted ravioli of the day, daily fish and tartare dishes as well. Other palatable options include arancini al tartufo, which consists of deep-fried rice balls stuffed with wild mushrooms, scamorza, and black truffle oil or the chicken breasts served in a mushroom sauce, roasted potatoes and the vegetable of the day. In addition to the exquisite cuisine, Aqcua has big windows that look out onto the cobblestone streets, with a décor comprised of vintage furniture, antique wooden floors and exposed brick walls that create a bright, cozy and open atmosphere that complements the neighborhood. Acqua often features special menus and holds a Chef’s Table series, in which guests can reserve a seat and indulge in a four-course meal and a wine pairing. The wine list is comprised of 70+ selections, with half of the wine list dedicated to Italian whites that complements the fresh fish and seafood. Chef Giuseppe Marrone has a larger than life personality and his success lies in the following factors – outstanding cuisine, warm service, and phenomenal wine programs – all in a relaxed and welcoming atmosphere. 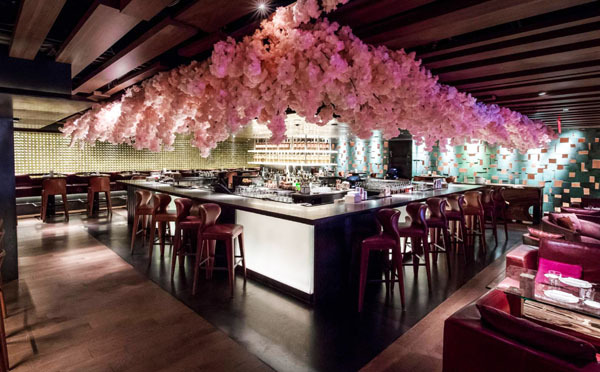 Taste the elements of contemporary Japanese cuisine at Zuma NYC, which pairs exotic, internationally-inspired dishes with a chic downtown décor to create an exceptional dining experience that continually piques the tastebuds of celebs, A listers and food connoisseurs. Inspired by the informal style of Japanese dining, Izakaya, Zuma’s signature dishes feature exclusive ingredients hand-picked and sourced from small farms across Japan by Head Chef Oliver Lange. Providing an authentic and interactive atmosphere for guests to indulge in all elements of the Japanese culture, Zuma’s masterfully crafted cocktail program features libations inspired by bold Japanese flavors mixed with premium liquors, as well as an extensive array of small-batch sakes. The bi level midtown eatery has two stories with three distinct kitchens: the main kitchen, the sushi bar, and the robata grill. Regardless of the kitchen from which the food comes, Zuma creates a dining experience of flavors that not only stand out on their own but also complement one another. The dishes are designed as Japanese tapas and are meant to be shared among diners. The best way to experience Zuma is through their Omakase menu that takes diners on a culinary odyssey and best paired with curated sakes that enhance the well balanced flavors. Each carefully executed dish is chosen daily by the chef and highlight specialties of the menu which changes seasonally. For fall, highlights include seabass sashimi with yuzu and truffle, tuna tartar with yuzu and caviar, wagyu tartar with truffle ponzu and miso, tempura langoustine, Alaskan king crab with ponzu lime butter, grilled Chilean seabass with green chili and ginger dressing, rib eye with shaved black truffle, and toro maki with caviar and a snow aged soy only found in one region of Japan. Save room for the show stopping dessert extravaganza that resembles a sculptural work of art, and summates the Omakase meal which demonstrates the art of fine culinary dining. Every New Yorker should be required to dine at Dos Caminos at least once. Few, if any, of the Big Apple’s Mexican restaurants can compete with Dos Caminos’ menu and ambience. The menu, though, is what sets Dos Caminos apart from other New York City restaurants, Mexican and non-Mexican alike. We started with the Shrimp Guacamole, which was richer and more savory than any guacamole I’ve ever had. Next was the decadent Ceviche sampler, featuring a delightful assortment of tuna estilo japones, red snapper de la calle & camarones apasionada. We wrongly thought the rest of the meal couldn’t possibly compare with those two dishes. The Mole Short Ribs may have been the best dish of the night; the slow roasted ribs were melt-in-your-mouth amazing. This was followed by the Camarones en cazuela, a superb jumbo shrimp dish with roasted garlic, chile guajillo, saffron chorizo rice and braised kale. Our side of sweet plantains could have been a dessert, but I was grateful to get it with my main course. Dinner was accompanied by delicious Margaritas. I’d consider going back to Dos Caminos once a week for the rest of my life. With four locations around the city, maybe I can. When I do come back it will be for the Chapulines- the Oaxacan Grasshoppers Guacamole. Hey, you only live once. 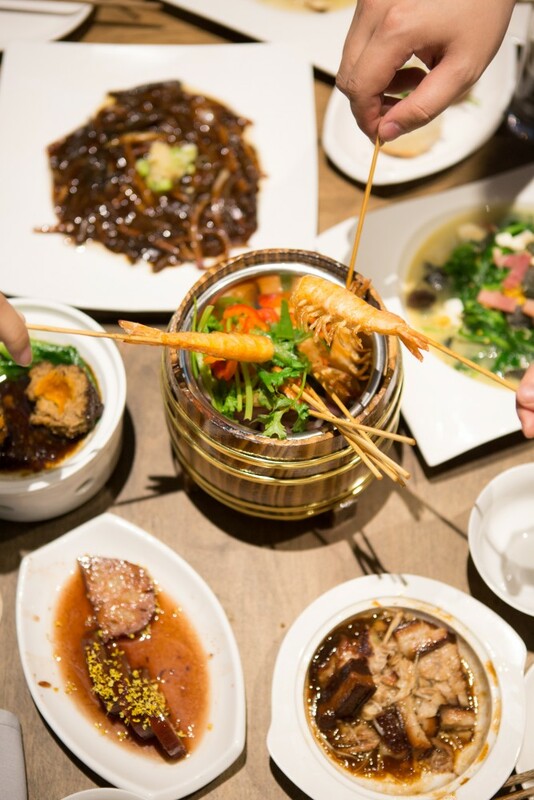 Located in Murray Hill, Little Alley is a Shanghainese restaurant serving traditional cuisine that will transport you to Shanghai’s famous longtang neighborhoods of interconnected, narrow lanes of rowhouses. Chef Cheung and his team, who are all Shanghainese locals, serve subtly-plated dishes with layers of flavor inspired by each of their traditions and upbringings. 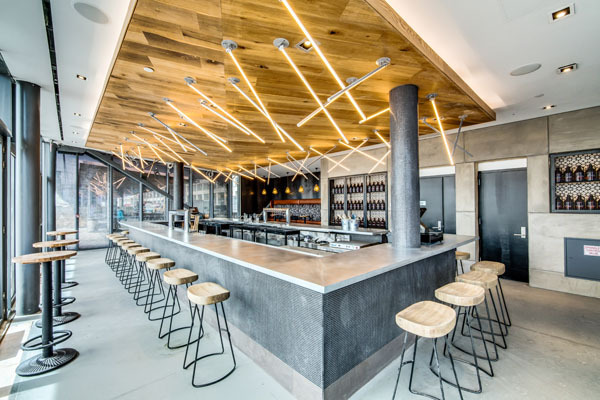 Industry Kitchen sits along the East River in the historic South Street Seaport. 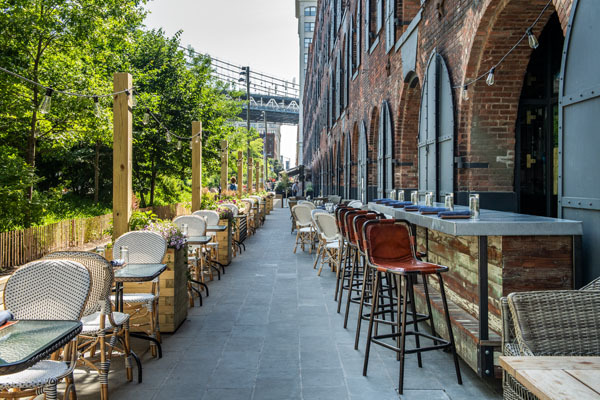 The restaurant has floor-to-ceiling windows that frame New York and open to an outdoor patio with stunning views of the water, including the Brooklyn and Williamsburg bridges. Industry Kitchen uses seasonal market ingredients to create modern American cuisine, making it the perfect place to grab an after-work drink or to host your next corporate event. It has something for everyone to enjoy. 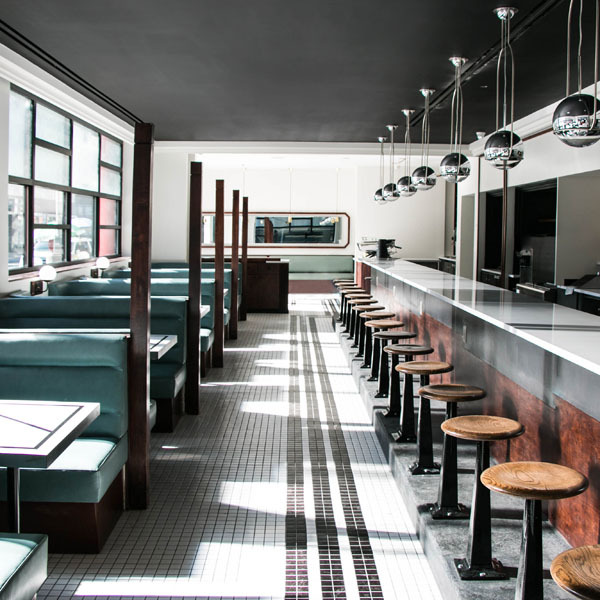 Nickel & Diner is a New American restaurant taking a sleek and modern twist on five-and-dime lunch counters and traditional diner culture. The Soho café is the perfect spot for both coffee and cocktails. 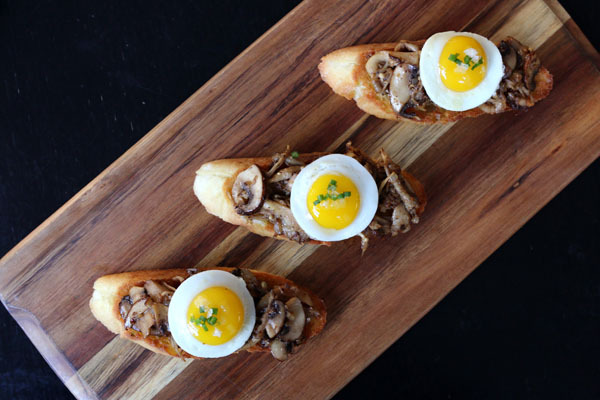 Chef Charles Cho cooks up a wide variety of food, recreating some of your favorite luncheonette dishes. Nickel & Diner provides an extensive amount of gluten-free and vegetarian options on the menu as well. SUGARCANE raw bar grill invites guests to eat, drink and be merry. This vivacious restaurant is located in Dumbo, Brooklyn, and it offers direct views to the Brooklyn Bridge. 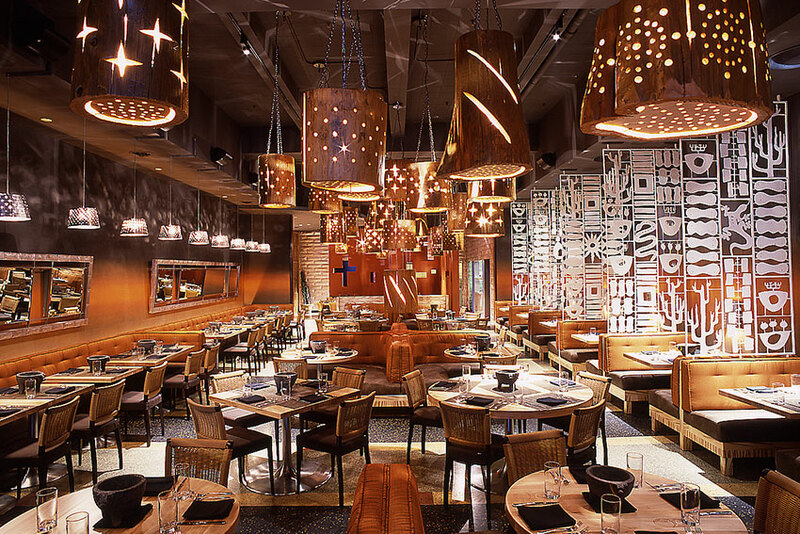 Sugarcane has three kitchens serving globally-inspired small plates, seafood, and sushi. Be sure to try one of their signature cocktails, such as the strawberry balsamic, made with premium vodka, fresh strawberries, aged balsamic and fresh lime juice.